Preheat oven to 375. Line two cookie sheets with parchment paper. In a large bowl, beat together the butter, sugar, vanilla and egg. Add the remaining dry ingredients. Mix until smooth. Roll the dough out onto a clean, floured surface. When the dough is about a 1/4 inch thick, cut 2 1/2-3 inch circles out of the dough using a cookie, biscuit or doughnut cutter. Place them on the prepared pans. Spoon some jam into the middle of each circle. Fold three sides towards the center and press down to form a triangle. Do not re-roll dough. Cut scraps into small shapes and bake as-is, if desired. Bake 12 minutes or until golden. Cool on a wire rack. Happy Purim! Another year, another kind of hamantaschen! This year was a little fraught because I just got back from the IACP conference in NYC which was fun but tiring and my rolling pin broke while I was rolling out the cookies! Oy! I didn't manage to make a whole batch unfortunately but the ones I made were really good. What is a more classic combination than peanut butter and jelly? Of course, for hamantashen, you need to use jam not jelly but the results are just as tasty as the classic sandwich, I promise. I used peanut butter powder (which is available nearly everywhere now!) instead of prepared peanut butter because I wanted the cookie to have that butter cookie taste and texture and it is hard to do that when using peanut butter as your fat. Peanut butter powder works more like flour so you can have that butter cookie but with the peanut butter flavor. 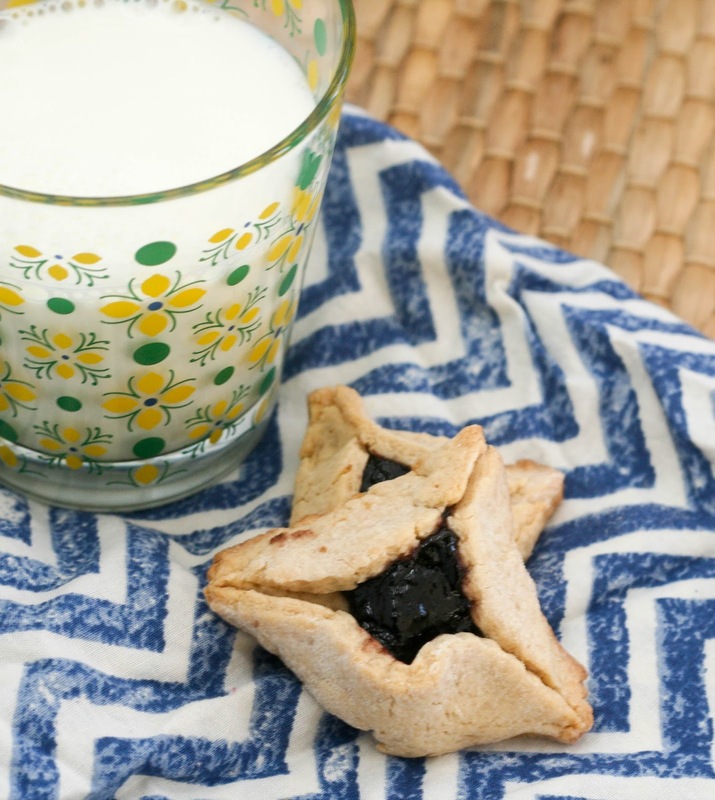 I wrote an article about Purim and hamantaschen for NPR a while back and since then, I've created recipes for a rugelach-inspired cream cheese based hamantaschen, chocolate hamantaschen, pareve/vegan hamantaschen filled with kiwi jam, orange ginger hamantaschen, and pareve/vegan fig-orange hamantaschen spiked with butternut squash, and double orange hamantaschen. Quick note: peanut butter dough is a bit more crumbly and finicky to work with than other rolled cookie dough. Roll to 1/4 inch thick and cut just once. Re-rolling the scraps is not advised. If desired, simply cut out shapes with the scraps. Do not make the cookies too thick or they will split when you shape them. Bring the stock to a boil with the garlic, ginger, and pepper. Add the noodles, snow peas, mushrooms and green onion and cook until the noodles are finished. Discard the ginger. Divide into two bowls. Top with meat, eggs and shichimi togarashi to taste. *I used noodles from two packets of this buckwheat-mushroom rice ramen but any ramen would do. 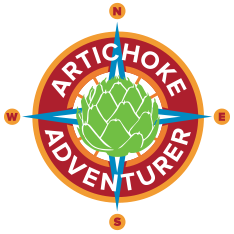 **I cooked an applewood smoked flavored pork roast from Aldi in a slow cooker over a bed of onions for 8-10 hours and then sliced/shredded it. We had the leftovers on rice for lunch the next day. I bought these interesting buckwheat-mushroom rice ramen noodles weeks ago and then didn't do anything with them. Matt made an Indo-Chinese feast over the weekend and bought some snow peas and mushrooms he didn't use so I thought it would be the perfect time to use the noodles and the produce before they spoiled. I quite liked the noodles. They really didn't taste too assertively of anything but were pleasant and I would think fairly good for you what with the whole grains and all. 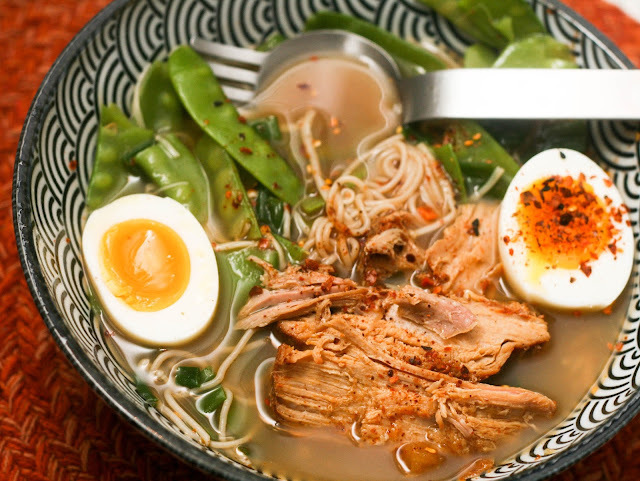 I had defrosted a pork roast I had bought at Aldi weeks ago and decided to pop that in the slow cooker to cook all day so all I had to do when I got home was make the eggs and heat up the ramen and veggies. Perfect for a weeknight! Is it as transplendent as the ramen I've had in good ramen shops? No. Is it very satisfying? Yes! Very flavorful and very, very quick to make. Since I made the meat in the slow cooker it didn't need anything more than slicing and the rest of the meal took literally 10 minutes to make. Plus it was an excuse to use my ramen fork. I really can't ask for more than that! Bring a large pot of water to boil. Add as many eggs that can safely fit on the bottom of the pan. (I use my spider to lift them in and out of the water carefully). Keep the water at a slow boil for 6 1/2 minutes then place in a bowl of very cold water for 2-3 minutes or until cool to the touch. Peel immediately. Serve or refrigerate, peeled in an air-tight container, for one to two days. 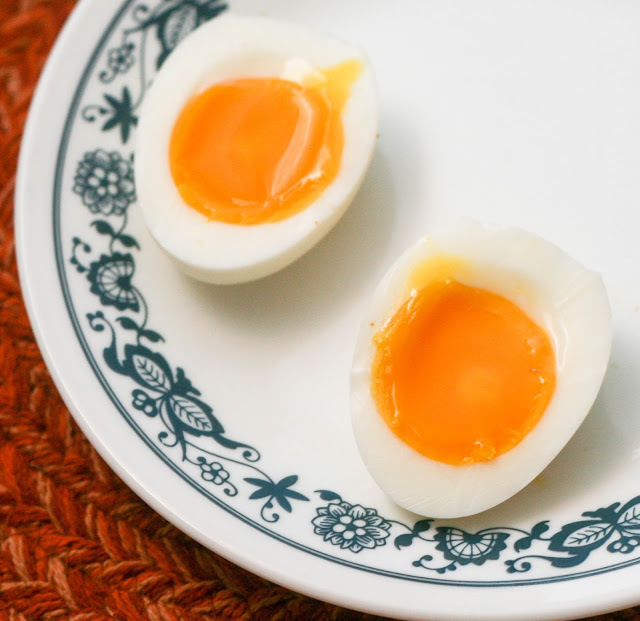 This recipe makes the sort of peelable soft boiled eggs that you find in ramen (I made these for my easy weekday ramen recipe) with yolks that have the texture of fondant in the middle and are drippy but also have a fully cooked white. Preheat the oven to 350. Line 2 cookie sheets with parchment paper. In a medium-sized bowl, whisk together the dry ingredients. In a large bowl, cream the butter and sugar until light and fluffy. Add the egg and vanilla and combine thoroughly. Gradually add the dry ingredients to the butter mixture and mix until a very thick dough forms. Fold in the chips. Form cookies by dropping 1 heaping teaspoon of dough two inches apart. Flatten slightly then bake until light brown, about 12 minutes. Slide them out on the parchment paper on to a wire rack and allow them to cool 1-2 minutes on the parchment on the wire rack before removing the parchment and allowing them to cool directly on the wire rack. It has been bitterly, bitterly cold here. No major snow thankfully but day after day of tempertures in the low teens and single digits. I've been trying to make things that use the oven or require one to boil water to help warm up the house without turning up the thermostat. If you are a long time reader, you probably have noticed I don't do a lot with whole wheat flour. The simple reason is that I don't care for it and if I eat too much of, I feel a bit queasy. Not true of buckwheat which isn't actually wheat at all. It has a nutty flavor and is high in fiber and protien. I mostly use it to make crepes or pancakes so I thought I'd branch out and make cookies with it. We are lucky to live within driving distance to a working, historic grist mill. They have a few events throughout the year (including my favorite, the corn roast) and we like to pick up some flours while we are there. Their buckwheat is really tasty and a bit coarse. It gives the cookies a nice nutty flavor (without nuts, which I don't love in cookies) and a firmer, chewier texture. Note: Buckwheat should be stored in the refrigerator or freezer to keep it from spoiling. I prefer the freezer personally. In a saucepan, melt the butter, cocoa, and chocolate together over low heat. Stir occasionally, and when the chocolate is nearly melted, remove from heat. Whisk until smooth. Set aside. In a small bowl, stir together flour, salt, and baking powder. Set aside. In a separate bowl with an electric mixer or in the bowl of a stand mixer, beat together the brown sugar, sugar, eggs, and vanilla until smooth. Slowly stream the chocolate mixture into the eggs and mix to combine. Gradually stir in the dry ingredients and mix until the batter is thick and glossy. Pour into prepared pan. Smooth the top. Set aside. In a medium bowl, beat together the cream cheese, egg, sugar, vanilla and flour until fluffy. Fold in chocolate chips. Carefully pour over brownie layer. Bake for 40 minutes, or until a toothpick inserted in the center comes out clean or with one or two moist crumbs. Cool completely in pan, on a wire rack. Do not slice before cooling!! RESIST TEMPTATION! It wasn't until a few months ago that I realized that black bottoms, the treat my family has been making for decades, wasn't a ubiquitous dessert all across the country. Thanks, Twitter! This explains why some people would give me puzzled looks when I'd say that my mom was making a dozen dozen black bottoms to give away for Christmas treats instead of cookies. After all, pretty much every bakery and most sandwich shops (even ones like Heavenly Ham!) in the Baltimore area sell black bottom cupcakes. 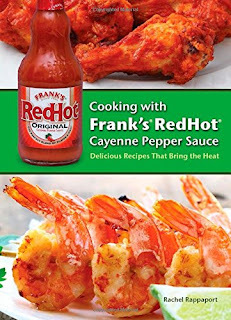 I can't find much about their origins online but most recipes have some reference to Baltimore or Maryland or trackback to a recipe that does. Very interesting. They really should be popular everywhere as they are basically a chocolate cupcake with a cheesecake filling, a universal combo if I've ever found one. I've made traditional ones, a Nutella-spiked version, and even pumpkin ones over the years. I was tempted to make some today for Valentine's Day but there are only two of us so I thought I'd stick with something with a slightly more manageable treat and convert them into another chocolatey treat: brownies! 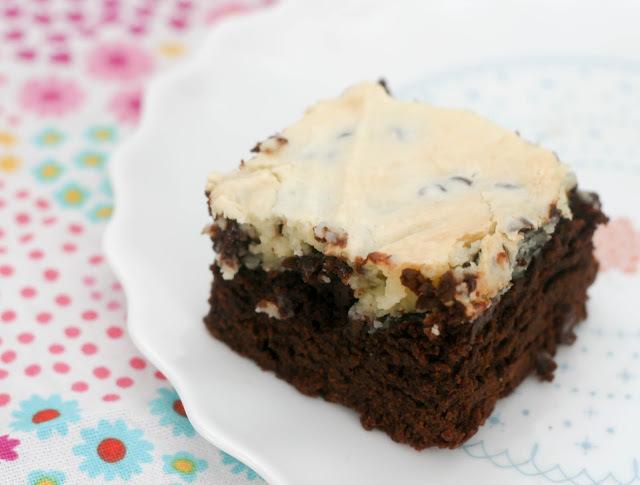 The brownie base is very rich and dark (nearly black with chocolate, hence the name!) but offset by the light, fluffy chocolate-studded cheesecake layer. So, so good. It is tempting to want to swirl the cheesecake but I find it is best to just let it have a layer all to itself for maximum deliciousness. In a large oven-proof pan*, heat a small amount of oil. Saute the sausage, peppers, onions, and celery until the onion is translucent and the sausage browned. Add the rice and continue to saute until the rice is well-coated and translucent. Add the remaining ingredients and bring to a boil. Cover and bake 25-30 minutes or until the rice is tender. Stir and bake 5 additional minutes, uncovered. Remove bay leaf. Serve hot. *if you do not have an oven safe pan, bring the mixture to a boil then transfer to a 2-quart baking dish (with a lid or cover in foil) and follow the remaining instructions. There are a lot of theories to the origins of this dish from Southeastern coastal regions of Georgia and South Carolina and I can't quite get to the bottom of which is correct but I do know it is one of my favorite ways to eat rice. 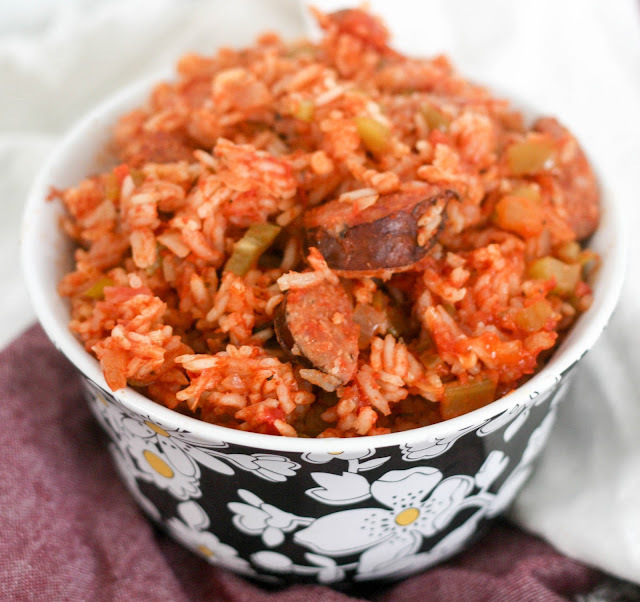 Traditionally it is made with bacon which not only coats the rice but gives it a smoky flavor but I had some extremely tasty andouille I couldn't resist using that. It makes for a spicer final dish but provides the same function that the bacon did. Unlike a lot of Southern rice dishes, red rice is started on the stove top and finished in the oven. This gives you the best of both worlds: slighly crisp edges and soft, richly flavored rice inside. You can serve this as a side dish, but I like it as a meal all to itself. Preheat oven to 350. Spray with baking spray or grease and flour one Bundt pan. Set aside. In a large bowl or bowl of a stand mixer, beat together the milk, juice, sugar, eggs, oil, and vanilla until smooth. In a separate bowl, whisk together the flour, salt, baking powder. and zest. With the mixer running, stream in the dry ingredients and beat until well-incorporated. Fold in the diced candied lemon peel. Scrape into prepared Bundt pan. Bake for 50 minutes or until a thin knife inserted in the cake comes out with just a few damp crumbs. Cool 10 minutes in the pan on a wire rack, then remove and cool completely on the wire rack. Whisk together the glaze ingredients in a small bowl. Drizzle cake with glaze then sprinkle with additional candied lemon peel if desired prior to serving. The glaze can be doubled if you want a really well-coated cake. Store leftovers at room temperature. *You can use homemade but I used Paradise candied lemon peel which is already cubed. I was really excited to see Meyer lemons at Aldi** recently. Not only were they pretty cheap, they can be tricky to find here in the mid-Atlantic. It is thought they may be the result of a spontaneous cross between a lemon and a mandarin orange which makes sense to me, they have the brightness of a lemon but are sweeter and more mellow like an orange. 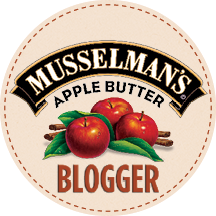 I like using them in baked goods because they have that sweet-tart quality I like in a fruity dessert. 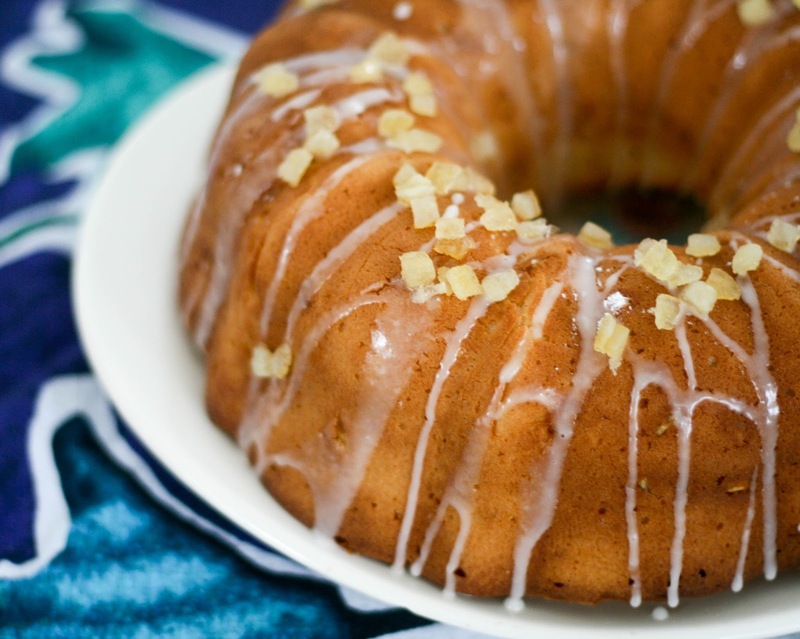 Here they flavor the cake and the glaze and get a little bit of help from the candied lemon peel, since citrus flavors tend to fade during the baking process. 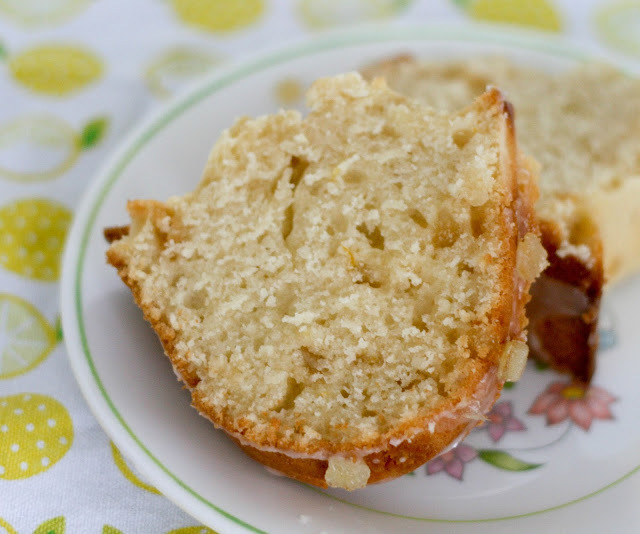 It is a pretty plain cake so you don't want to skip on the lemon flavor! This cake is super quick to put together because it uses oil instead of butter so you can (as I did) decide to make a cake and have it in the oven in less than 10 minutes. It takes a while to bake and cool but the mixing part couldn't be faster or simpler. The cake is so good! Light yet moist at the same time. **Shameless plug for my Aldi fan blog here. Preheat the oven to 350. Line 2 cookie sheets with parchment paper. In a medium-sized bowl, whisk together the dry ingredients. In a large bowl, cream the butter and sugars until light and fluffy. Add the egg and vanilla and combine thoroughly. Gradually add the dry ingredients to the butter mixture and mix until a very thick dough forms. Fold in the chips and coconut. 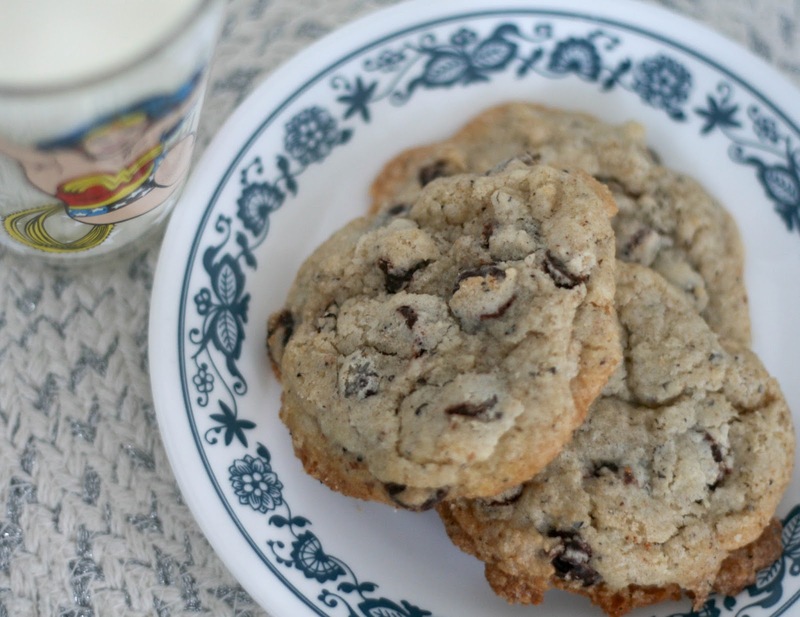 Form cookies by placing roughly one heaping tablespoon of dough one inch apart. We used this medium cookie scoop, leveled off. Bake 13 minutes or until the cookies look basically set but perhaps still puffy in the center, these cookies do not spread much. Slide them out on the parchment paper on to a wire rack and allow them to cool 1-2 minutes on the parchment on the wire rack before removing the parchment and allowing them to cool directly on the wire rack. Last night we were bemoaning the lack of dessert and baked goods in the house and my husband offered to make cookies. I gave him this recipe to try. He is a much more meticlous baker than I and the cookies came out so perfectly uniform and round, I could hardly believe it. When I use the same cookie scoop, my cookies come out much more "rustic"--he carefully leveled off each scoop so no errant chip hung off disrupting the perfect scoop. 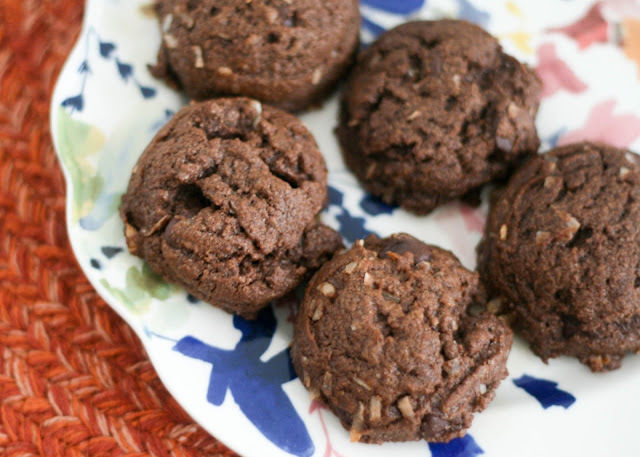 The results were a perfectly domed, slightly soft cookie full of chocolate and coconut. Exactly what you need on a cold, winter night.